War of the Spark rekindles the power of artifact decks in MTG. Magic: The Gathering is bringing back the strength of artifacts with its new expansion, War of the Spark. With a pre-release date at the end of April, the expansion will include a whopping 36 planeswalkers as the war on Ravnica enters its final stages. 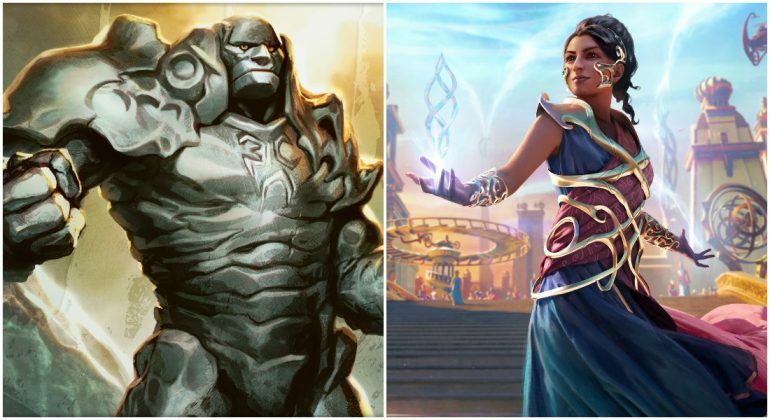 Beefing up artifact decks in Vintage, Commander, Modern, and possibly even Standard play is Saheeli, Sublime Artificer and Karn, the Great Creator. With the addition of so many planeswalkers to MTG War of the Spark is the mechanic, static ability, in conjunction with loyalty counters. It’s in these static abilities where Saheeli and Karn make their biggest impacts upon the game. This means the 1/1 servo artifact creature token can copy and become a much larger creature already on the board until the end of turn. 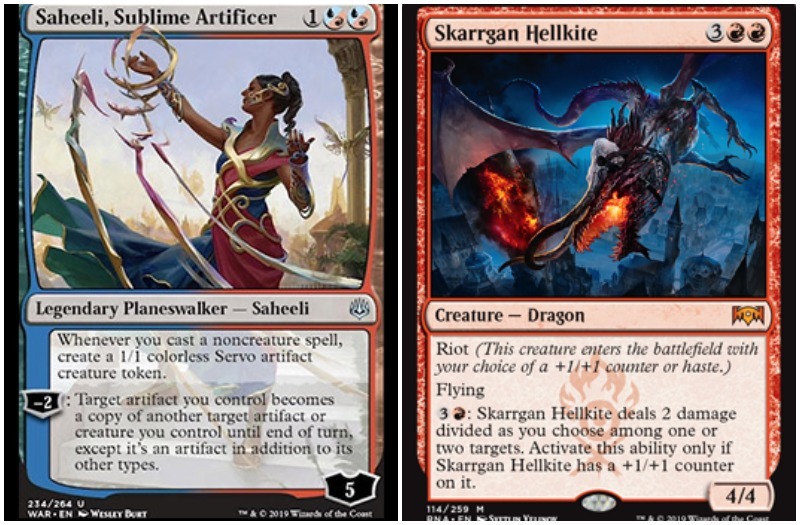 Drakes will work exceptionally well with Saheeli, along with cards like Murmuring Mystic, Skarrgan Hellkite, and Rekindling Phoenix. In addition, return loyalty counters to Saheeli, Sublime Artificer with proliferate. War of the Spark is bringing the proliferate mechanic back to Magic: The Gathering with lands like Karn’s Bastion and creatures like Flux Channeler. Karn, the Great Creator is a four colorless mana rare planeswalker who comes onto the battlefield with five loyalty counters. Much like Saheeli, his greatest power lies in his static ability: “Activated abilities of artifacts your opponents’ control can’t be activated.” In combination with Mycosynth Lattice from the Battlebond expansion, the opponent won’t be able to tap their lands. MTG Arena players, sadly, won’t be able to use this combo since Battlebond is no longer in Standard rotation. 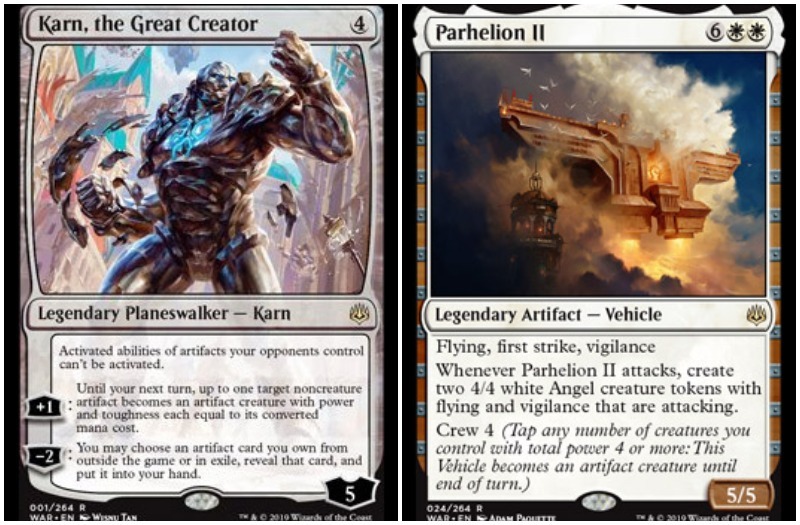 With the addition of Parhelion II (Legendary artifact vehicle) to War of the Spark, a triple threat begins to form with Saheeli, Karn, and Parhelion II. It’s an eight mana cost (two white) which needs a crew of four to activate (servo tokens). Once activated, Parhelion II is a 5/5 with flying, first strike, and vigilance. And to top it off, it also creates two attacking 4/4 white angel tokens with flying and vigilance when it attacks. Use Saheeli to create tokens for the crew while Karn brings Parhelion II into play, even if it’s been exiled. The War of the Spark expansion will be available to play in MTG Arena on April 25, 2019.